I am so excited about this weeks #SundaySupper. We were all given the task by our host of the week, Sunithi of Sue's Nutrition Buzz. gave the group a mission to make a low-cal, low-carb, low-sugar, low-fat or simply a nutritious and healthy dish. 90% of what I cook at home is healthy, yet I had a very difficult time with choosing one dish. One thing I love to do is turn something generally unhealthy and turning into something that is good for you. When we first moved to Tampa, I had to learn how to cook without a grill as we live in a Condo. 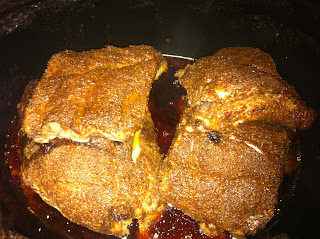 I missed my parents baby back ribs and found a way to turn them healthy and cook them inside. Enter the slowcooker. I researched many recipes online to find out that you can in fact cook baby back ribs in the crockpot. I have made this recipe many times and it is fail proof. The key is to cook them slow. Do not try to cook them on high heat at a shorter period of time. Note: the main photo of the ribs above is stock photography. My brand new camera's memory card got wiped out, causing me to lose nearly 1,000 photos, none of which were backed up and I did not have time to remake this. Luckily, I had old photos of the prep which I was able to use. 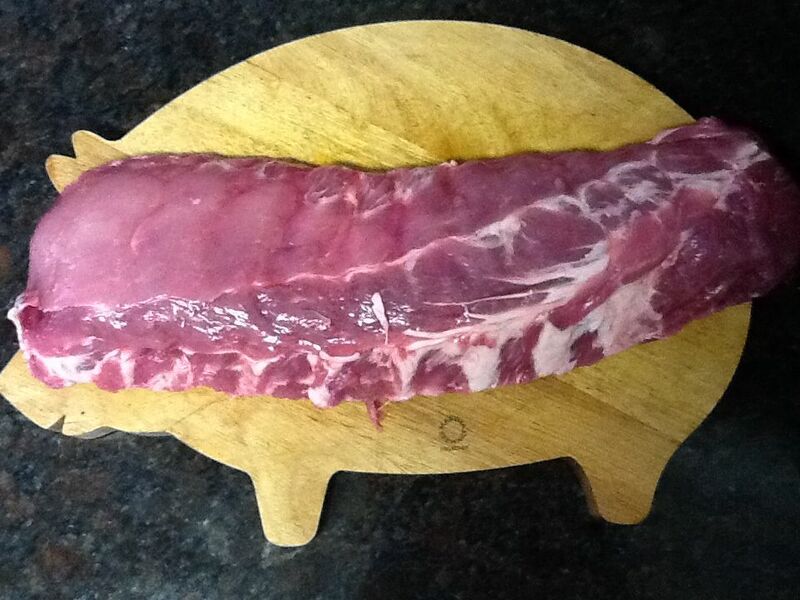 Take a 3lb slab of baby back ribs. Remove the silver lining from the back. I find it easiest to do right when you remove the ribs from the fridge. The coolness makes the silver lining much easier to remove. This is key, if the lining is still there, the ribs will be tough. I make a slit down the middle and pull. Do this before you cut your ribs in 4's. 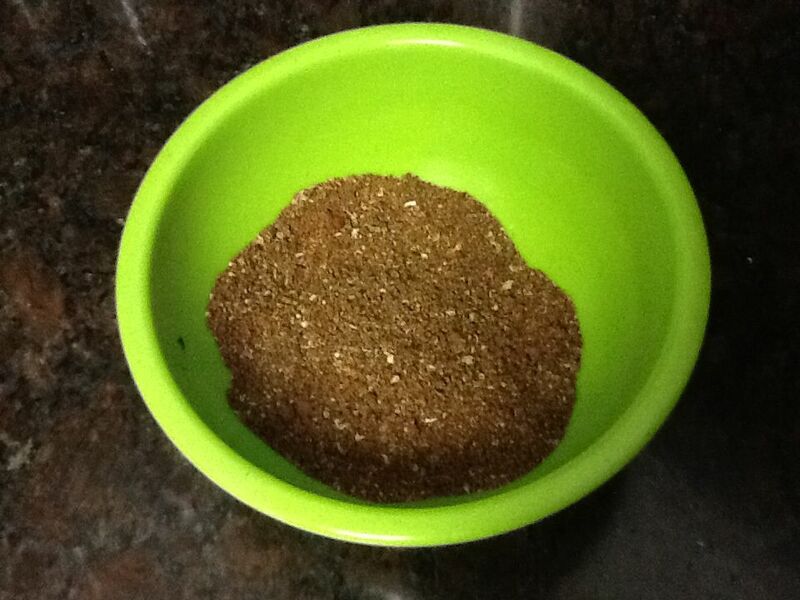 Now it's time to make your dry rub. I have received rave reviews on Just a Pinch Recipe Club for my par-boiled baby back rib recipe. I use the same dry rub for my crockpot version. Give the ribs a good rub down. Make sure you get both the front and the back. Cook with NO liquid on low for 8 hours. Then take about 2 tablespoons per rib and paint with BBQ sauce. I prefer Sweet Baby Rays honey chipotle but use whichever you prefer. Cover and leave on low for 30 minutes. If you prefer a crunchy outside, you can do this in the oven on broil, just watch to make sure they don't burn. A half a slab of ribs BBQ'd with tons of sauce would get you at 500-700 calories, whereas this one with the rub and 2 tablespoons of sauce will only be around 250 calories. I love that this can be made in a slow cooker. We enjoy our fair share of ribs during the summer months but it is nice to know that I can cook them inside once in a while. Thanks for the recipe! 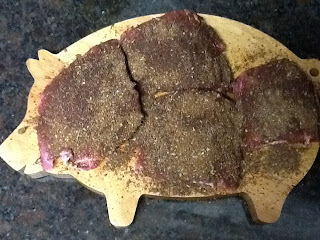 I have to tell you, I love the pics of the pig cutting board... so sorry about your camera. It was so wonderful to see you yesterday! Oh my, these look fantastic! I would surely broil them and then lick my fingers... Love that piggy board! Yum! These look fantastic! Thanks for sharing!! I would never have thought to put them in without any liquid! I can hardly wait to try this!! And I see why your rub gets rave reviews - such a lot of great flavors in there! Is there any more sickening feeling that when a memory card or computer goes belly up and everything is lost? It has happened to me and so, now, I make a point of downloading more often. And then backing up on the external hard drive. I am so sorry for your loss! This is great ! You took your favorite dish and made it healthier with a cooking technique ! 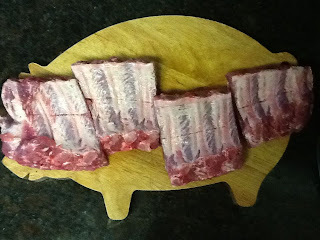 Love ribs and will try these myself sometime. Thanks ! Lovely pics. Great slow cooker recipe! I'm always looking for easy recipes. I've never tried ribs in the slow cooker, but I will now! So smart to use the slow cooker...I've never tried it for ribs before! I know Justin would love it.. Slow cooker ribs? I don't know about this one but I have to admit it sounds delicious and your end result looks fantastic. Slamming on the brakes to check out a healthy recipe for ribs. It is such an indulgence (usually) and I don't have them often. It's looking like it will be rib night very soon. I just saw another recipe for slow cooker ribs. We are die hard ribs fans. This will be up next weekend. I cannot wait. I love your cutting board! I have wanted to try crock pot ribs. Next time we have friends over I will make this for them. Yum! Love me some baby back ribs and I bet the meat is falling off the bone after 8 hours in the slow cooker. Definitely going to give this a go! Thanks for sharing! This looks awesome! I love doing ribs in my slow cooker, but this makes it so much healthier. And yes, like everyone else... LOVE that pig cutting board ;-) Thanks for sharing this! I'll echo the chorus: I am in love with your cutting board!! Your ribs look fantastic as well. 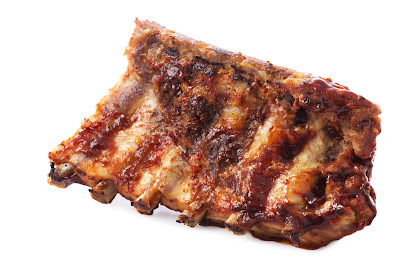 We love baby back ribs, and we'll have to try using the slow cooker very soon! Ah, the miracle of the slow cooker. Bravo for your skinny sweet and spicy meat rub, Meg! 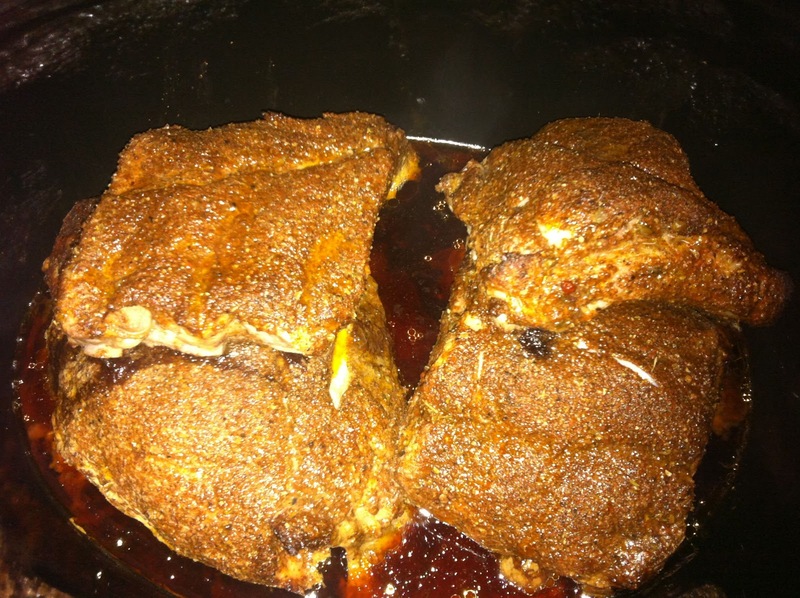 Wow, never made baby back ribs in a crock pot. . very cool!!! Love it! I would eat this every day of the week! I NEED to get a crock pot so that I can make these ribs!!! Do you think a dutch oven or the regular oven would work? I love ribs so much and this rub sounds fantastic. Sorry to hear you lost all your photos :( Hopefully your adorable pig shaped cutting board brightens up your day (it would for me - just looking at your photos brings a smile to my face! ).